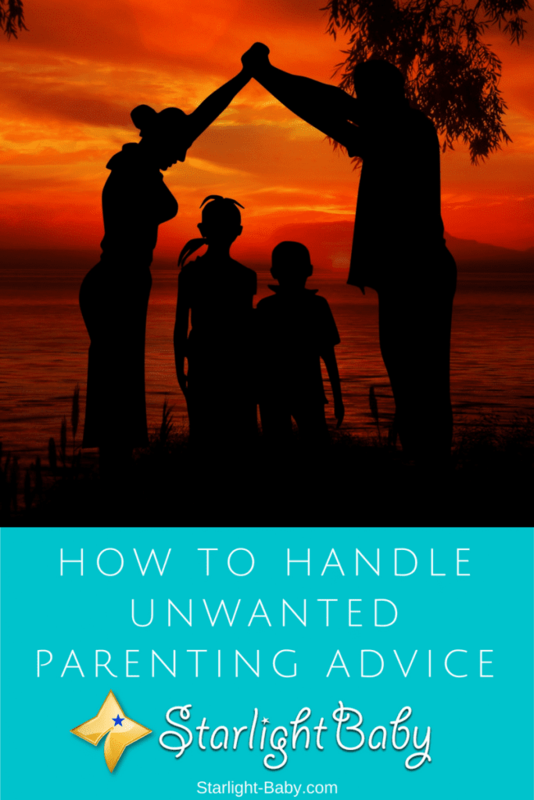 If you’re sick of being told what you’re doing is wrong and how you should be doing it, below you’ll discover the best ways to deal with persistent unwanted parenting advice. Nothing further needs to be added to that. It makes the person giving the advice feel like they have helped and puts you under no obligation to follow it. You successfully avoid hurting anybody’s feelings and it’s a response you’ll also feel satisfied with. If you find the same person is still bombarding you with unwanted advice as time goes on, drop the response to just a smile. Saying nothing is sometimes the politest way of letting the person know you don’t need any more advice. The most important thing to remember in either of these instances is the smile! When you’re constantly being given unwanted advice, you’ll soon start to automatically resent it. However, some of the advice you’re being offered could actually be pretty good. Before dismissing the advice being given to you, really think about whether it could be useful. It could be the person giving you advice delivers it in the wrong way, such as coming across as bossy. Or, you may be frustrated simply because it wasn’t something you’d thought of. Both could produce an automatic annoyance that’s hard to push aside. However, learning to curb the anger and keep an open mind can actually be really helpful at times. You may just come across a piece of advice that really makes your life easier. Let’s face it, being a new mom is hard work so anything that makes it easier in the long-run should be welcomed with open arms! It’s one thing getting advice from friends and family, but when it comes from complete strangers it’s something else entirely. Unwanted stranger advice is given far too freely from the minute your pregnancy starts to show. People you have never come into contact with before and likely never will again, all of a sudden pop up out of nowhere with all kinds of advice and warnings. It’s enough sometimes to make you want to punch them in the face! However, what tends to work pretty well is humour, or more precisely – sarcastic humour. For example, if your toddler starts to have a full-blown tantrum in public and a stranger asks “Aww bless, are they having a bad day?”, you can respond with something along the lines of “Not at all, you should have seen them on Friday!”. These little statements tell the person you have parenting experience and you’ve done it all before. Of course, if you’re dealing with strangers, you could still lie and pretend you have other children at home. After all, they don’t know that you don’t and it’s an easy way to stop the advice in its tracks before it continues! If you’re receiving unwanted advice from a family member, it could actually be better to sit down and talk to them about it. Addressing the problem in the right way will not only help to stop the advice, but also reduce the risk of any fallout. Often, people don’t even realise they are being a little pushy or a little too free with advice! Sitting down and talking about how it makes you feel is a good start. However, there’s a right and a wrong way to do this. If you want to maintain a good relationship, it’s important to be as polite as possible, while also standing up for yourself. Start by telling them how much you do appreciate the advice they have been giving. Then go on to explain that you’d like the chance to discover some things yourself. That parenting is a learning curve and it’s sometimes important to learn by any mistakes you might make along the way. Once you’ve let them know how their unwanted advice is affecting you, quite often you’ll find it stops. It’s also worth thanking them for caring enough to give advice and let them know they will be the first person you turn to if you need advice on anything. Overall, dealing with unwanted advice can be tricky. It’s hard when you’re trying to keep everyone happy, to know how to stand up for yourself without hurting people’s feelings. Generally speaking, if you’re polite and thank them for the advice before gently dismissing it using the tips above, that should be enough. At the end of the day you need to do what feels right for you. Well, I’m always using the polite answer, I say thank you but if the advice I receive it not seem to be right for me, then I ignore it and I do as I know as is better for my child. It is very hard when an old woman comes and offer her advice and knowing her age I must respect her and her opinion and calm her down saying that her advice is great and I will use it., but sometimes it is not useful at all. The truth is that there are some people who structure themselves to be more better and perfect than anyone else in terms of parenting but they can be so wrong because that something worked for them doesn’t mean it would work for another in the same position. Anyways when they get rolling with their numerous unwanted advice, only one thing comes to my mind which was something my mentor told me. He said and I quote ” A yes doesn’t bring about disagreement or quarrel but saying no gives you a direct opposite of what yes would prevent”. So I would just simply say yes in agreement to whatever the person is yapping about and go my way in peace and do what I have in mind. For the first few days, my wife could not produce milk for the baby. We had to feed formula milk to the baby. After a week, milk began to produce, however, it was not enough for the baby. We continued feeding formula milk. We used the doctor recommended dose and feeding time. However, there were people who told us to feed more. It was hard to refuse them because they were experienced parents and very close relatives. We wanted to follow the doctor’s advice strictly, however, people were suggesting a different thing. It is really hard to stay away from unwanted advice.